Assign key report stakeholders, internal deadlines, and regulatory timelines. Workflows notify users, update statuses, and schedule recurring events to help meet global and local commitments. All information entered into Orbit is available in your report templates. Additional Integrations with internal systems bring line listings, safety surveillance activities, and more. With Orbit Product Overview, managers see upcoming commitments. Orbit dashboards bring KPIs such as Upcoming Tasks and Past Due tasks. Track the completion of all of your reports: PADER, PSUR/PBRER, DSUR, RMPs, and even define your own. Generate aggregate report documents from your organizations templates. 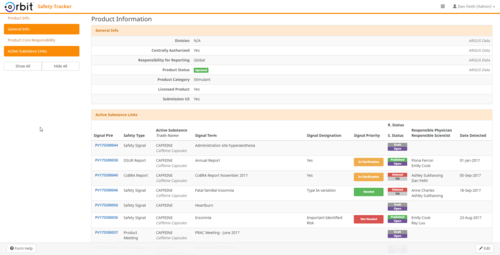 Orbit Aggregate Report Tracking integrates data from multiple sources into your documents, including product information and line listings.